The Kriesler Radio Company was founded in 1928 by brothers Alec, Leo and Rae Weingott. Their original registered office was at 43 Alice Street, Newtown, in inner city Sydney; in later years the company relocated to premises in Caringbah, in Sydney's southern suburbs. The Weingotts originally intended the name to be spelled "Kreisler", referring to the legendary composer and violin virtuoso Fritz Kreisler, but they changed the spelling to avoid any legal complications. For its first five years of operation Kriesler concentrated on the manufacture of "stencil lines" (house brands) for music emporia such as Elvy's and Palings. But by 1933, as the Depression worsened, the company was in financial trouble and liquidation seemed inevitable. Kriesler was at this time one of 243 registered radio manufacturers in Australia. The company was rescued by an investor, Percy Tuit, who had made his money from a hosiery wholesaling business. He offered to buy the about-to-be liquidated Kriesler Radio Company, and he generously loaned the youngest of the Weingott brothers, Rae, sufficient capital to purchase a 49% interest. Kriesler continued to make stencil brands, but from this time on they concentrated on making and promoting their own Kriesler brand. "Rae Weingott had flair. To see him present a new season's range of products at the Trocadero or old Wentworth Hotel, was an experience never to be forgotten. He was the master of the remotely controlled "magic lantern" and "voice over" techniques, well before it was used by others. One would believe he was presenting a new season's range of motor vehicles, not mere radios." Kriesler made a major contribution to Australia's 1939-1945 war effort, and this was commemorated in the special 1948 Mingay's edition commemorating the effort of the Australian radio makers. After the war, Kriesler made good use of its special advertising account, which had been "put aside" during the war; that, plus inspirational phrases from Rae Weingott, such as: "Mirrorscopic Tuning", "Triple Throat", and those "Three Little Words - Kriesler Triple Throat"; resulted in Kriesler being ranked third in Australia's radio manufacturers prior to the advent of television in Australia in 1956. Perce and Rae sold Kriesler to the Dutch music and electronics giant Philips around 1950 because they did not have the capital to go into television manufacture without floating Kriesler as a public company. They also believed their loyal staff deserved consideration and did what they felt was best for them. 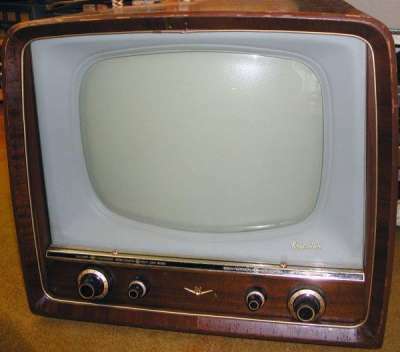 The model 121-1 was the first Kriesler TV set, made in 1956. Based on Philips circuitry, it was nevertheless of all-Australian design and manufacture. Kriesler continued as a leading radio and TV manufacturer during the Fifties and Sixties. In 1966 Kriesler's director of industrial design Harry Widmer (who was also a noted rock band manager/agent) won the prestigious F.H. Edwards Laurel Award for his design for the Kriesler Mini 41-47 portable radio. Prior to this time most portable radios were made from bakelite, but the 41-47's great innovation was its polypropylene plastic casing. The use of this material would later become almost universal in consumer appliances, but the competition judges noted that this was the first such application anywhere in the world. The indigenous consumer electronic industry collapsed after 1973. In part, this was because many manufacturers, protected by punitive tariffs and import quotas, became complacent and the quality of locally made goods declined. Another major stumbling block was the 1974 decision to introduce colour TV in 1975. Designing and building the technically complex colour sets locally was considered too great an investment risk for most companies. But the single biggest cause for the catastrophic decline of local manufacturing was the Whitlam government's controversial 25% across-the-board tariff reduction. Overnight, it cut the tariff protection for local manufacturers, opening the consumer market to a flood of cheap, high-quality Asian imports, against which local manufacturers were, in the long run, unable to compete. Over the next 20 years the gradual winding back of tariff protection led to the demise of virtually every Australian-made brand, including Kriesler. Their Caringbah factory was closed in 1982 and the Kriesler name finally disappeared from the Australian market when the company was offically wound up on 31 December 1983. In a final irony, as noted by Age journalist Greg Strong, vintage valve radios produced by companies like Kriesler, Astor, Healing and AWA are now fetching enormous prices on the international collector's market. Top-quality sets sell locally for hundreds of dollars but the best examples are regularly being bought in bulk by cashed-up Asian dealers, who resell them to collectors in Japan for thousands of dollars each. Do you have more information about Kriesler? This is a fantastic site for anyone interested in vintage Australian radio and TV, with extensive listings and photographs of most of the major Australian brands and models. "Australian made is out of service"